Isigny Sainte-Mère is Norman and proud of it! 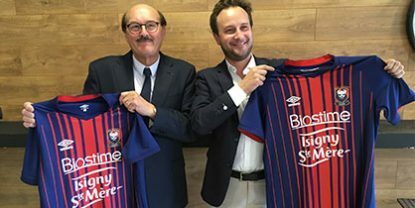 We are pleased to announce that our Cooperative is the new major partner of the Stade Malherbe de Caen ! From the start of the next Ligue 1 season, we will be there to support the team. Come on Malherbe! On the photo: on the left: Daniel DELAHAYE (General Manager of the Coopérative Isigny Sainte-Mère), on the right: Charles RAVEL (General Manager Europe H&H/Biostime). 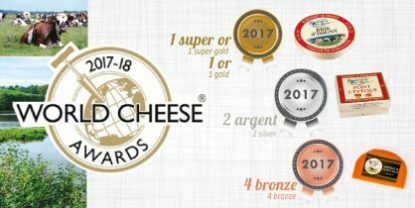 The quality and excellence of Isigny products has again been awarded on november 17th, at the World Cheese Award in London. 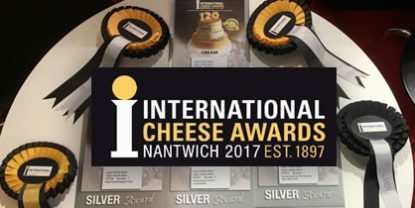 The quality and know-how of Isigny Sainte-Mère have been awarded again with 7 medals at the Nantwich International Cheese Awards this year. 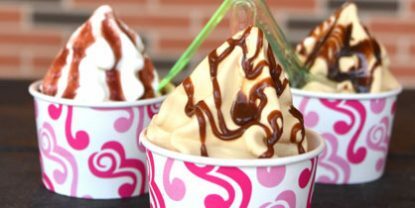 The Isigny Sainte-Mère ice cream season is open ! Taste delicious vanilla or caramel creamy ice cream. Devour ice cream in a pot or in a cone (little pot : 1.50€, big pot : 2.50€, cone : 2.50€). In a pot, you can add a sauce : salted butter caramel, strawberry or chocolate. – in July and August, since Monday to Saturday, from 11h30 to 19h, at the Coopérative shop. – 7 days a week from 13h to 18h30 at Halles d’Isigny. 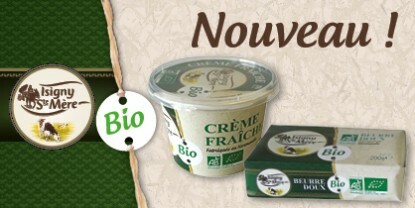 Now available in store, Isigny Sainte-Mère’s latest additions to its organic range are the 20cl organic crème fraîche and 200g unsalted organic butter. These products are made with the greatest respect for tradition and are made exclusively with milks from organic farms (AB certified). This is a natural and obvious commitment for the Isigny Sainte-Mère dairy co-operative, founded 85 years ago. The first Isigny Sainte-Mère shop, the fruitful outcome of a long-term collaboration with the Korean group Hyundai and its Hyundai Department Stores subsidiary, opened in Seoul on March 1st, 2017. Located in the heart of Hyundai (Food Mall), one of the group’s most attractive shopping centres, the shop offers a selection of Viennese pastries made with Isigny Sainte-Mère butter. The product range offered in this shop is made from start to finish by our local Korean partner. All the butter used is made by Isigny Sainte-Mère, including our Protected Denomination of Origin (PDO) Isigny butter. 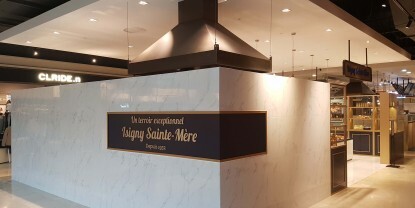 Isigny Sainte-Mère already enjoys great popularity in Asia. Isigny Sainte-Mère wishes to continue to promote its know-how and the quality of its products, thanks to this exclusive partnership with South Korea’s leading luxury retailer, Hyundai Department Store. The partnership was signed officially on Thursday, 16th March at 4pm in Isigny-sur-Mer. Among those present were Mr Arnaud FOSSEY, President of the Administrative Council, Mr Daniel DELAHAYE, Director General et Madam Jungran HONG, Director of Hyundai’s Food Division and their respective teams. The quality and excellence of Isigny products were awarded once again on february 27th, at the Concours Général Agricole in Paris . 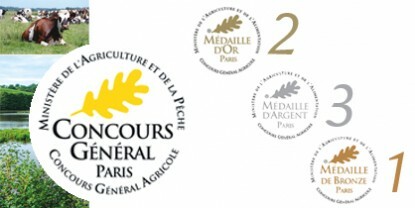 Quality of Isigny products awarded ! 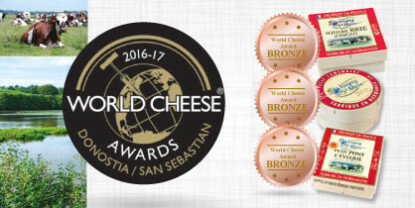 The quality and excellence of Isigny products has again been awarded on november 16th, at the World Cheese Award in Spain (the bigest cheese competition in the world : more than 3000 cheeses and 31 countries in competition). Find us at the SIRHA which will be held from saturday 21 to wednesday 25 january in the Eurexpo at Lyon. 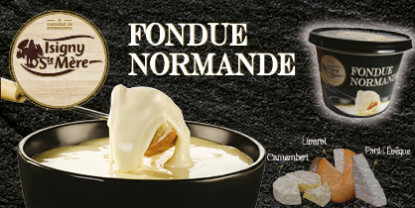 Now, find out in stores our Normandy fondue with 3 cheeses:Camembert, Pont l’Évêque,Livarot and sweet taste of cidre and calvados. Just right for special occasions and ready to use, microwaveable.